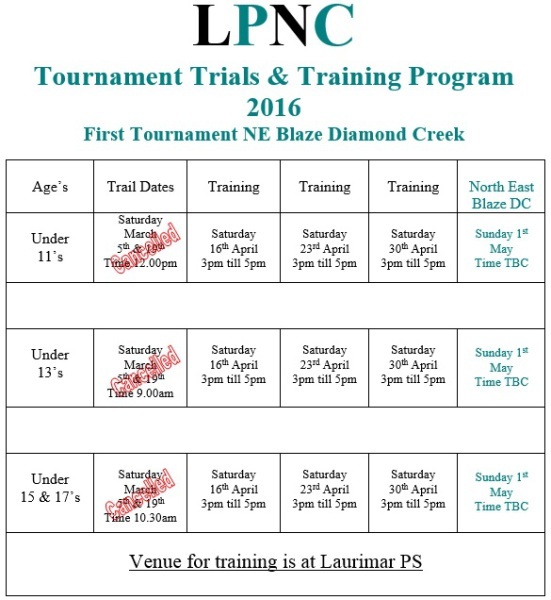 All players that would like to participate in the LPNC tournament teams are encouraged to train in this program. The tournament trials have been canceled. Instead, we will be taking expressions of interest for players that would like to play in the tournament. All members thatexpress their interest must be available to train on the dates outlined in the training program below. It will cost $20 per player on tournament day which cover the cost of an umpore and team entry fee. Printed forms have been made available during The Saturday Junior Comp and Monday night training. Alternatively, you can register your interest using the online registration form below.